The Hip Strip, located on Gloucester Avenue in Montego Bay, Jamaica, is a must-see place if you are planning on going to vacation in Jamaica anytime in the near future; as it is loaded with plenty of great bars, clubs, restaurants, shops, and other entertainment venues. The Hip Strip is also located in close proximity to many popular beaches including: Doctor’s Cave, Cornwall and Walter Fletcher beach. The following 6 places are among the most popular bars, clubs, and restaurants, located on the Hip Strip in Montego Bay, which are frequented by locals, as well as international travelers. Margaritaville in Montego Bay, Jamaica, opened in 1995 by two local veteran businessman, Brian Jardim and Ian Dear of the hotel and real estate industries. Margaritaville is a fun and exhilarating place to go with friends, family, or a significant other to enjoy great local and international food, drinks, and live entertainment on Gloucester Avenue in the heart of the Hip Strip in Montego Bay, Jamaica. 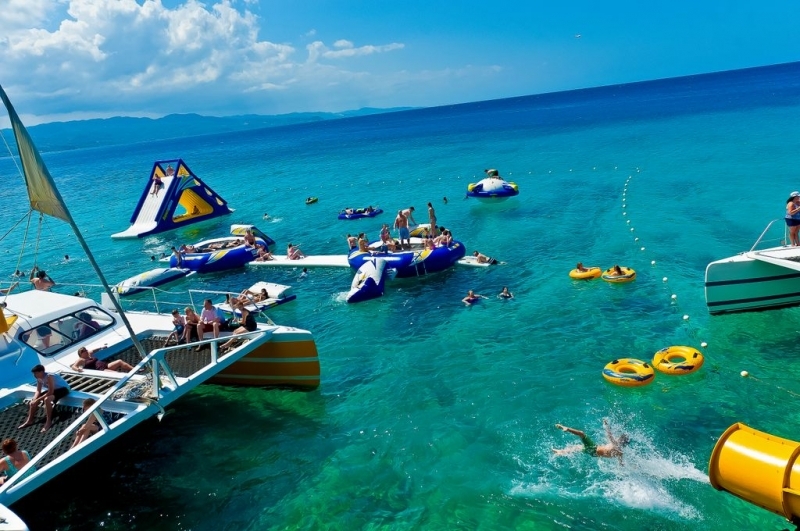 Margaritaville also has outdoor water activities, including a 120 foot water slide, two water trampolines, and water volleyball, which are only open during the day. Margaritaville is only 10 minutes via taxi or shuttle bus from the Montego Bay Pier for any cruise ship passengers. At night Margaritaville turns into a night club party atmosphere with in-house DJ’s and special themed event nights, such as Bare As You Dare, Glow, and Ladies Night. Some of the celebrities who have visited Margaritaville in Montego Bay over the years include: P. Diddy, Nelly; Run DMC; Tiger Woods; Dennis Hopper; Cindy Crawford and Uma Thurman. For more information you can visit the official Montego Bay Margaritaville website. Blue Beat Ultra Lounge is a more upscale and elegant Jazz and Martini bar located next door to Margaritaville on the Montego Bay harbor front, and is the first of its kind in Montego Bay, which opened in 2004. 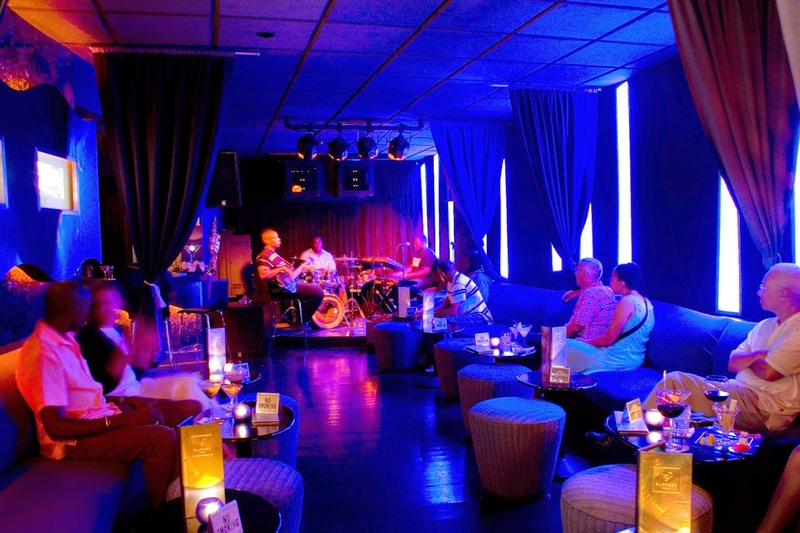 Blue Beat has live local bands, such as resident band, Scotch, and an in-house DJ; as well as special themed music nights, such as Copacabana Latin Flare and Saturday’s Guest List. In addition, there are live comedy nights; an unplugged music series with local and international music artists, and an outside lounge area with couches and chairs, steps away from the Caribbean Ocean. Cover Charge: depends on events taking place. Check official website for more information. 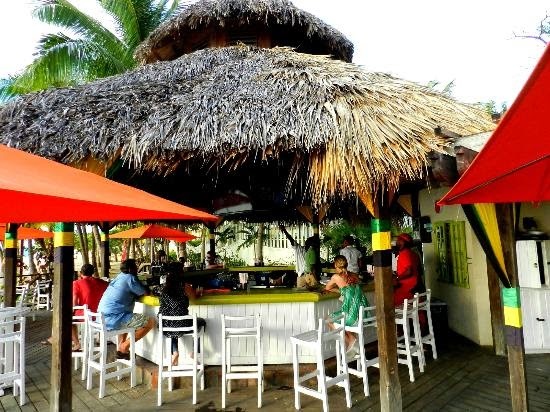 Pier One is a fun and affordable bar located on a small Pier in Montego Bay, which is a great place to have some cheap drinks and dance while listening to live music. Friday’s are Pier Pressure ladies night’s ($10.00 cover charge) and rum drinks are only $2.00 on Fridays. Pier One is also a great place to have some food and in particular seafood, for instance, Sunday’s are Seafood Sundays. 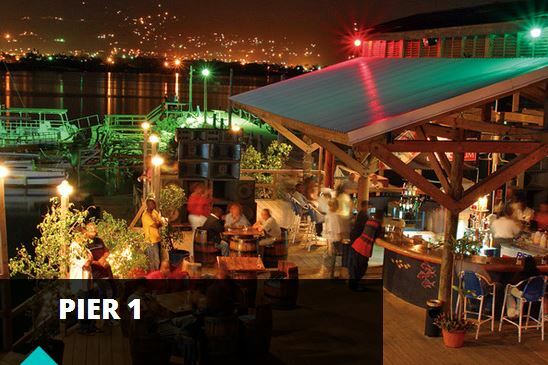 Pier One also hosts Dancehall Queen and Reggae Sumfest music events on their main stage. Hours of Operation: Check official website for more details about their hours of operation. Cover Charge: Depends on events going on. Check out official website at: http://pieronejamaica.com/ for more information. The Brewery is one of the cities’ most popular nightlife hang out spots that is a cross between a British pub and a Jamaican jerk-pork pit, which has a wooden bar, medieval memorabilia, and a covered veranda at the back, overlooking busy Gloucester Avenue. Cover Charge: No cover charges. The Jamaican Bobsled Café specializes in “New York Style” pizza, but customers can also order other items, such as burgers, salads and platters, ranging from $5.00 to $22.00 U.S. In addition, the Jamaican Bobsled Café has a large digital clock counting down to the next winter olympics; as well as the Jamaican 1988 Winter Olympics team’s winning bobsled, which you can pay to get a photo of yourself and friends and family in. 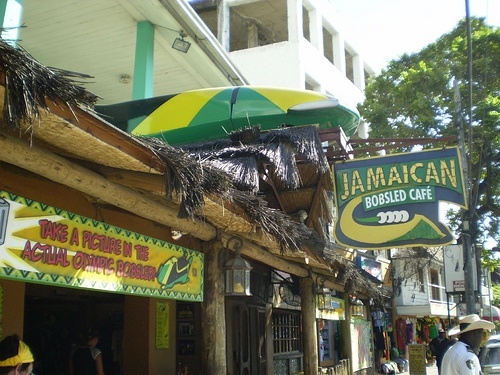 In addition, the Jamaican Bobsled Café has inside and outdoor seating areas. Hours of Operation: Not Sure. Cover Charge: No cover charge. 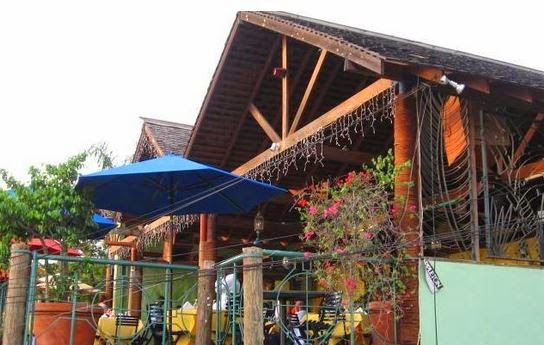 The Groovy Grouper is a bar and restaurant located at Doctor’s Cave Beach, located within Doctor’s Cove Bathing Club, which costs $5.00 U.S. for admission during the day, but is free after 5 P.M. The Groovy Grouper has various specialty rum drinks, such as the bartender’s special “Groovy Delight”. The Groovy Grouper also has some unique local specialty cuisine, including: Conch Chowder (or fritters) with wings and salad, and Jerked Calamari. Friday nights are all you can eat seafood night for $20.00 U.S./person. Hours of Operation: 9:00 A.M – 2:30 A.M. 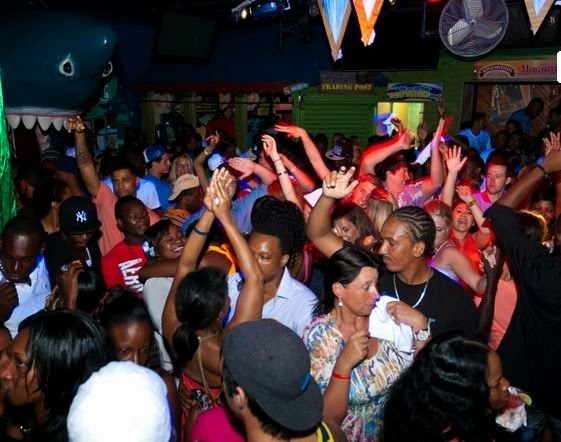 Although this is not a completely exhaustive list of popular night clubs, bars, and restaurants located on Montego Bay’s Hip Strip; these local nightlife hotspots are likely some of the most interesting and fun places to dance, drink, eat, and party the night away, while you are visiting Montego Bay. At Travel Around Jamaica Tours, we would greatly appreciate it if you would let us know what your favorite Montego Bay bar, club or restaurant is and why? If you are interested in booking private transportation to any of these Montego Bay Hip Strip nightlife locations, please visit our official Travel Around Jamaica Tours website or contact us at: info@travelaroundjamaica.com or 1 (876) 287-2180.